In just a short month here, I will be headed off to enjoy a few sunny weeks in the Dominican Republic with Nick. While our vacation will be a combination of relaxation and adventure, there is always so much to do before a vacation to ensure that you have the best time possible, without worrying about anything that may happen- either while on vacation, or once arrived home. As such, today I will talk about all of the things you should do the day before a trip to ensure you have the best time ever! Print out all relevant travel info. I always take the time to print out any copies of my reservations. Even if you have e-mail confirmations of this, you never know when you may not have access to the internet (or a battery to even use the internet!) Having hard copies of the information will be incredibly helpful as you travel to your new destination. Even if you don’t use them, you can always simply recycle the paper and be glad you had it available as a backup! Clean out your purse/bag. This is an essential step to ensuring you only bring things you actually need. The pile of change at the bottom of your purse? Get rid of it. Same thing with any cards/memberships in your wallet you will not need while on the trip. Not only will this physically lighten your load, but it will also help you in the unfortunate case if your wallet/purse gets lost, as there will be less to replace. Do laundry & clean house. While this may seem like an unnecessary step, often when arriving home from a trip, you will have loads to do anyways. Arriving home to a clean house, with fresh sheets, will make the transition between vacation life and regular life much smoother. Make sure to take out the trash too! Check in for your flights & confirm what time you need to arrive at the airport. Most airlines now allow you to check in for your flights 24 hours before. Check in so that you can confirm you have the right seats on your flight and travel information. When Nick and I most recently traveled to Berlin, if I had not double checked our travel information, we would have headed to Schönefeld airport instead of Tegel- a huge mistake that could have resulted in us missing our return flight! Working? Set up an automated e-mail, let your colleagues know you will be away, and decide upon 'rules of engagement' while away. If you are traveling, make sure your colleagues know that you will be away, and communicate to them if/when/how you will be available. Chances are, you don't want to be boggled down with work your entire vacation. Communicate to them if you will be checking e-mail at all, available by phone, etc. Make sure to set up an automated e-mail stating that you are away from the office as well; this will help remind clients and coworkers. Fully charge your electronics. This is especially helpful if you have a long flight ahead. Nobody wants to sit on an 8-hour plane ride with a dead iPad/phone/etc, so make sure to fully charge all of these before you leave the house. Bonus tip: as soon as you are doing using the wifi on these devices, shut this off. It will save battery life as you are using these devices on the road. Unplug appliances. Take a look around the house, and figure out a few things you can unplug to save on electricity while you are gone. Check the weather. Hopefully, at this point of the upcoming trip you have already packed and planned ahead for the weather. Do one last check to make sure you have packed the proper clothing, and that your day-of outfit is appropriate! Stay hydrated. Staying hydrated is important any day, but especially before you embark on travels and any type of flight. This will help you feel more rested, recharged, and ready to vacation. Get a good nights sleep & get excited! Once you've made your list and checked everything twice (or twelve times, if you are me), get to bed early and get excited for your upcoming trip. Everything that needs to be done is done, or if it isn't- chances are, it can either be taken care of or wait until you are home. Of course, there are tons of other things you may want to do the day before traveling to help make sure your travels go more smoothly. Depending on how much you travel, you may want to alert your credit card companies. If you will be gone for a long time, arrange to either place a hold on newspaper/mail delivery, or for someone to pick it up. My golden rule of traveling: anything you don't want to do immediately upon coming home, get done before you travel so you can put it off for a little while once returning home! 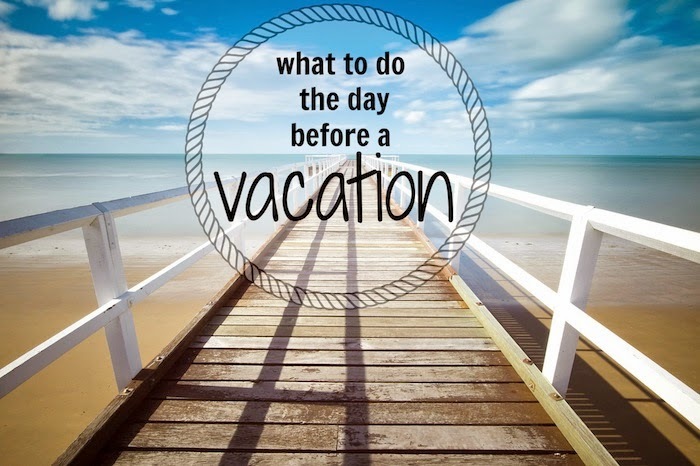 Vacations are about relaxing and enjoying your time away from home, so do whatever you can in the days leading up to departure to make sure you can maximize your time while on vacation. What are the things you always do the day before you travel? Great list!! I agree with charging electronics and setting up email responses! SO helpful! I for some reason always forget to charge my electronics until the last minute and then am grabbing them off the charger as I walk out the door, which means I tend to forget the charger. Keeping this list handy for next time I travel! Just saw this- my husband is like you and forgets to charge his electronics. I've gotten in the habit now of plugging them in for him whenever he isn't using them! Definitely makes it a lot easier to come home- and its not fun to come home in the first place! Thanks for stopping by, Jen! Thanks Adrian, I'll have to check them out for when I go on a cruise! I head to the Dominican Republic next week (flying!) but am definitely looking into cruises! Great tips! I always clean the house before we travel. I hate coming home to a dirty house!